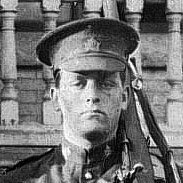 William Percival Hogg was 22 years old when he joined up at Winnipeg in November 1914, the same age as Leslie Payne. This was not the only thing they had in common - both were sons of land and estate agents and had grown up in Normanton, a southern suburb of Derby, in the county of Derbyshire. William was the sixth of nine children of William James Hogg and his wife Louisa nee Scholes. He was born on 21 August 1892 at Trent Vale, Staffordshire, but the family moved to Derby soon after his birth. Initially, they lived at 62 Normanton Road, but later moved to 48 Sackville Street. It seems likely that William Hogg senior and Leslie's father, Charles Vincent Payne (1868-1941) knew each other well, and may have had business dealings. It is possible that Leslie and William Hogg junior went out to Canada together in about 1912. By late 1914 he was working, presumably in Winnipeg, as a steward. He was 6 feet tall, weighed 165 pounds, had brown hair and blue eyes, and described himself as "Church of England". He was immediately promoted to the rank of Corporal.